Over the years, friends and family have gifted me things that are related to my cardboard habit, but which are not actual bits of cardboard. 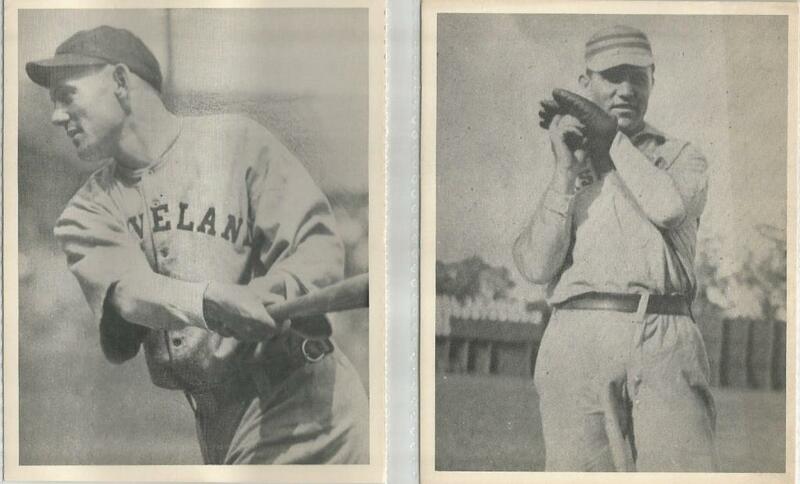 I keep these in my overall collection and, yes, they are listed in my database of Indians "cards." Obviously, the ability to add such things to one's electronic record keeping system is crucial... Well, it is for me, anyway. First up, we have two unopened packages of stickers. On the left, these 3d stickers show off two jerseys, some headgear, Chief Wahoo, bats, balls, and if you look closely: two admission tickets. 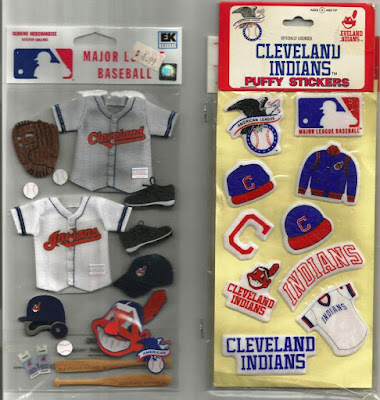 On the right, we have Puffy Stickers! If memory serves, those stickers above were either Christmas or birthday gifts from my wife. Not in the same year, mind you. My wife does a great job of finding cool things to add to my Indians collection. Below, we have more stickers... And a set of keys. The jersey at the top is a felt cutout that I believe came in a pack of cards or a cereal box or something. 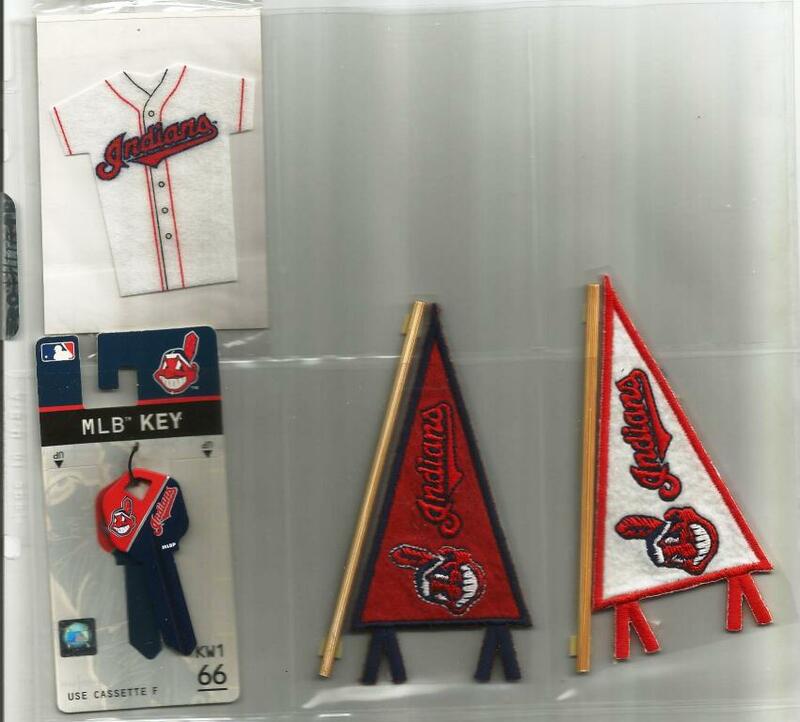 The two pennants are stickers and they are fantastic. I wish I had more of them just so I could stick those babies up in my office somewhere. And, finally, a pair of uncut keys. 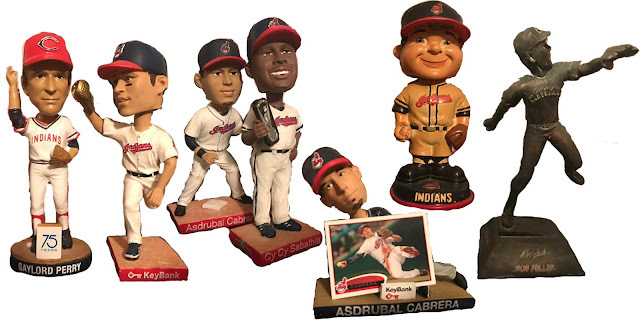 So, as you have surmised from this and previous posts (you know, like the one that showed off my Indians bobbleheads), you can see that I collect MAINLY Indians baseball cards. But, sometimes, I add things to the collection which aren't cards, but (I think) are still pretty cool. 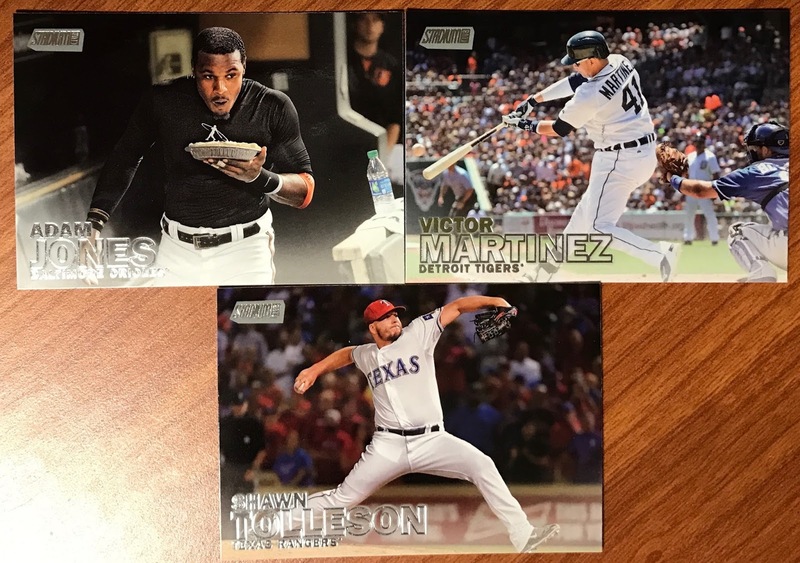 It has been a LONG time since I've posted a TonT pack break, so I thought it would be fun to do! This is roughly the tenth edition of the game I've played. I am also starting a new ranking system to see which TonT's netted the best (er, and worst) results. More on that at the end of the post. This is a Fat Pack of cards, so there are 24 cards with 3 inserts. Let's get crackin! My new ranking system for TonT goes like this: I take the raw score and divide it by the number of cards used to get the raw score. That will give me the Calculated Score. I will use that score to rank packs from first to worst (the higher the score, the better). The ranking system appears (or will appear if you are reading this before I get done with it) as a tab at the top of the site. I received this little jewel as part of package I got from PunkRockPaint many, many moons ago. 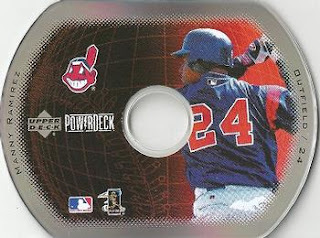 The "card" is actually a CD-ROM with various features on it. The other day, I fired up my computer screen recorder and captured my computer playing through the program. I stepped through each feature, so feel free to pause in order to read on-screen text as needed. Like many of the cards in my collection, I have things that I own and do not recall how I came to possess. This cool piece from the 1993 Sporting News Conlon Collection is one of my favorite Bob Feller cards ever. I think it's because it is perfectly in tact and includes the the promo paper with it. The first thing that folks may notice is that it is a Conlon card, but the border is blue! 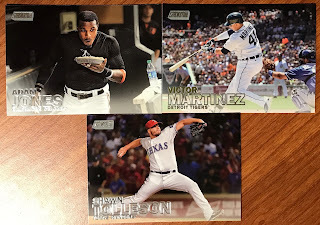 I don't recall seeing other Conlon Collection cards having a color photo and blue border (regular issue were black border with black-and-white photos). This version of the card was only available through the purchase of the Sports Collector's Digest Price Guide of 1993. I tried to determine the print run on these, but I couldn't come up with anything. 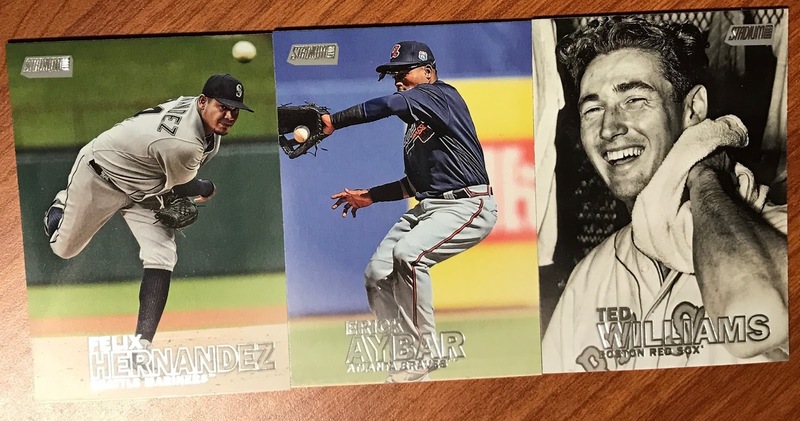 Apparently, there are 48 total "color" variations of Conlon cards, but the Feller is the only one available exclusively through the purchase of the price guide. The title of the post is slightly misleading, but I didn't know of another way to say it appropriately. You see, these 1993 bookmarks were made by Diamond Marks and feature photos from the Barry Colla Production company and the design is by Terry Smith Creations. So, basically, it took a team to put these things together! The cards are 2.5" wide by 5" long. The photography is great, especially for 1993. The fronts feature the player name in all-caps white lettering, the DM logo, a HUGE picture of the featured player, the team logo and colored stripes, then the team name (again in all-caps) at the bottom. The bookmarks feature a black border which helps make the color elements really pop. 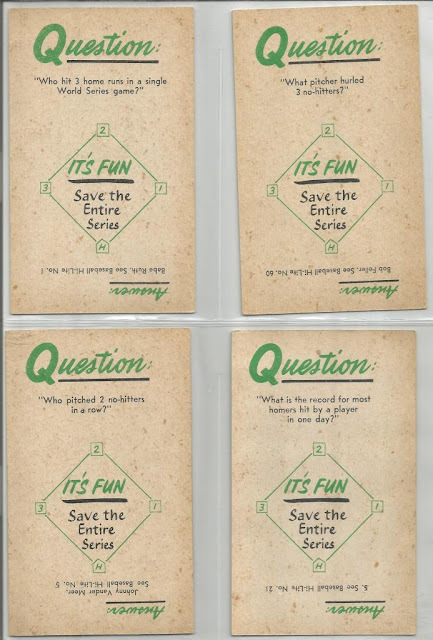 The backs feature a cool "open book" design with a different photo on the left plus a fun tam logo-based bookmark. The right side features a cropped version of the front image plus the player's name and position. There's a "fun fact" about the featured player as well as logos, copyrights, etc. A little research finds that there were 120 bookmarks in the set and they were sold in packs of 10. There was also a test set of 10 cards available. These are definitely some of the coolest oddball items I have that aren't food-related. 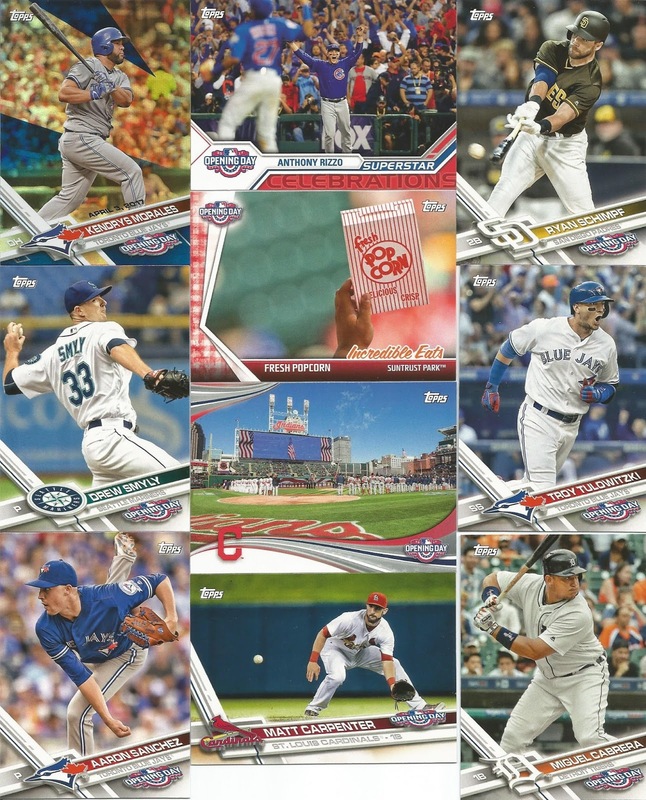 Well, since our quest to find a card shop in Hot Springs went belly-up, I ran into the Walmart here and snagged a pack of 2016 Stadium Club. 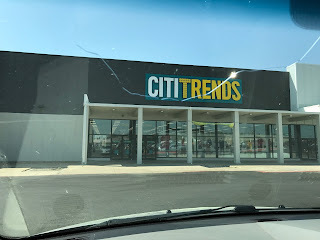 I believe this is the first time I've even see these. They are certainly a throwback to the glory days of Stadium Club, and in this case, that's not a bad thing. 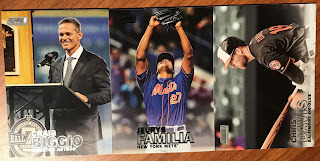 I love the full-card images and the photography on the cards. The subject matter is a matter of debate, for sure, but I guess so long as it is baseball, we're okay, right? 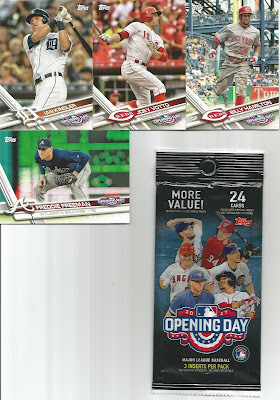 I didn't pull any current Indians players, but I did pull former Tribers and some stars/HOFers from days gone by. Excuse the image quality as I am posting these while sitting at the table in the "resort" room where my family is staying during our Spring Break. *Note: The place we are staying deems itself a "resort," though I would argue it is a hotel that happens to be lakeside... Maybe that qualifies it as a resort... Story for another day. In 1976, I was 7 years old and deep in the throws of my formative collecting years. I've told stories here before about collecting cards and the awful things my friends and I would do to cards in those days. Now, before you start to think back TOO far, we were beyond the days of using cards in our bike spokes. In fact, I'm not sure any of my friends did that - that was before our time. What we did, however, is probably considered much worse, much nastier. Much. Nastier. You see, in 1976, we wanted to be sure that our collections would be preserved for all time. And so, we enshrined our cards not in mere pocket pages (which I suppose were available, but we knew nothing of them) nor in shoe boxes nor any other kind of protective storage. Rather, we chose to glue our cards into spiral notebooks. Yeah, read that again. We glued our cards into spiral notebooks. 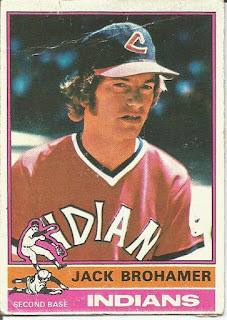 The Jack Brohamer I have in my personal collection is one of the few bits of evidence and artifact of those days long gone by. I could have easily replaced this card with a specimen in much better condition. In fact, I probably have other '76 Brohamers in my duplicates boxes. But, that isn't the point. The point is, in my head anyway, to have this keepsake to reflect on those youthful days before we knew what "collecting" was really about. In the photos below, you can see (especially the card back) the remnants of my brutality. I mean, sure, it was bad enough we glued them in, but, we didn't stop there. 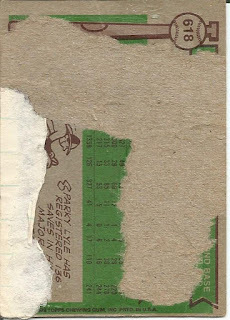 When we were ready to trade or flip our cards, we simply peeled them off the lined pages to which they had been so meticulously glued. This made for rendering most of the cards completely useless. In fact, most of the cards would simply separate the fronts from the backs. As you see, that's mostly what happened to poor Brohamer here. Though I cannot say I am proud of the way we treated our bits of cardboard heroes, I can also say that I do not regret such actions. For you see, we were kids. We weren't caught up in book value and future collectibility studies. No, we were wanted to have our keepsakes mounted in the most permanent thing we had at the time. Those really were simpler days. Not saying they were better, just simpler. I've tried to rack my brain and remember just how I managed to acquire these two cards from the 1974 Capital Publishing collection. Try as I might, I just can't recall. 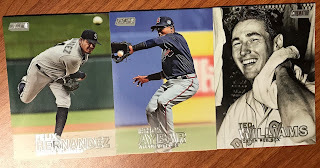 Generally, that means one of two things: 1) I bought them on eBay (probably as part of a bigger Indians card lot) or 2) They were sent to me by one of my awesome cardboard habit enablers (that would be one of you). Either way, these are cool "cards." I say that in quotes because these are about 4.5" x 5.5" and feel like postcards. On the left, we have Ray Chapman and the right is Al Orth (Phillies). The photos are black and white, as you can see, and are evidently taken from VERY old photos that are probably in the public domain (or were at the time these were made). 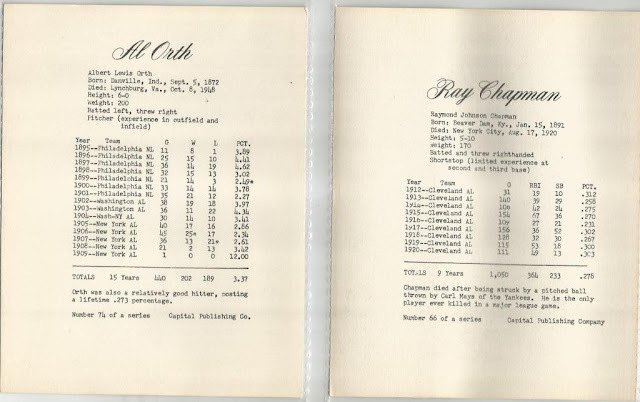 The backs feature biographical info and stats from the years they played ball. Note: The backs are just the fronts flipped, so they don't match the pictures above. 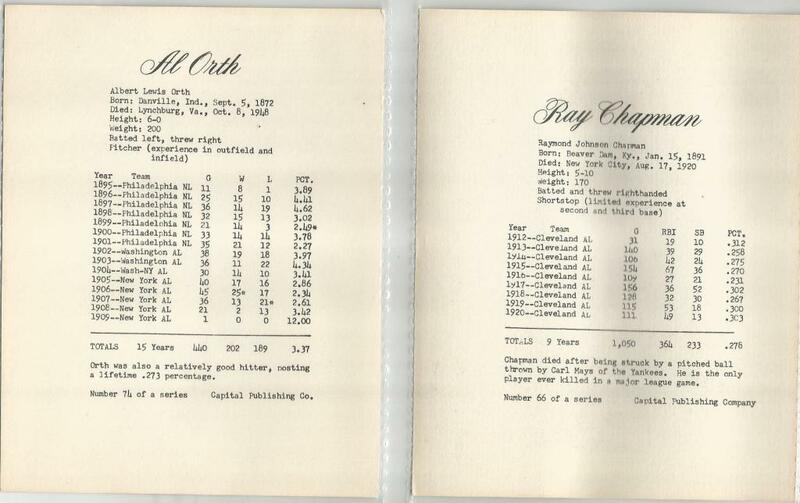 Apparently, Capital Publishing released several "versions" of these (some folks refer to later versions as reprints, though that could be debatable). 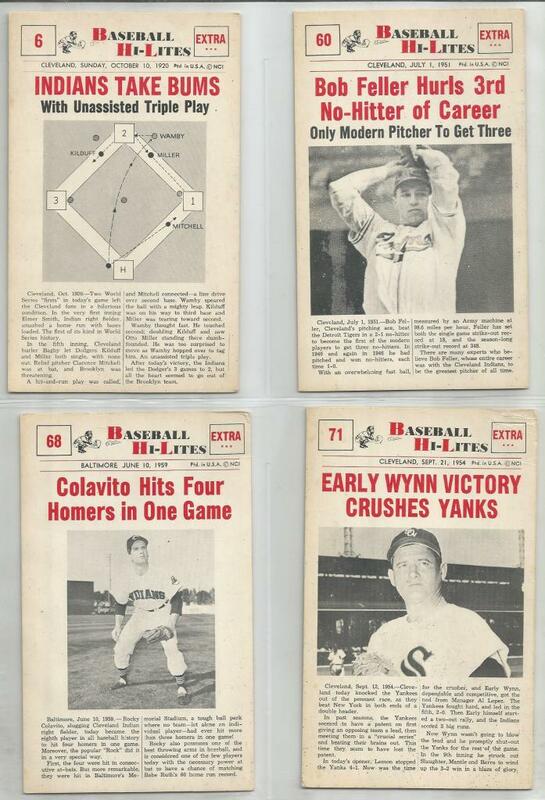 One way to know these are the '74 variety (at least in my research) is the numbering at the bottom. 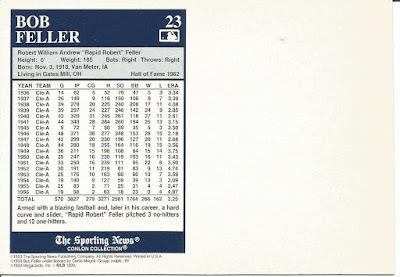 Later versions do not include the card numbers. There are 110 cards in the set. I have no idea why I have the Phillies player in there. Haha! 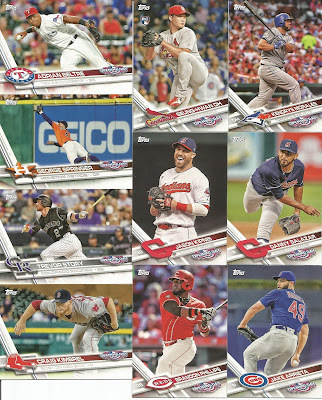 If you are interested, the list of Cleveland players in the set are listed below and there is a link to the full set below that.